Everyone loves a good sweet bread recipe! 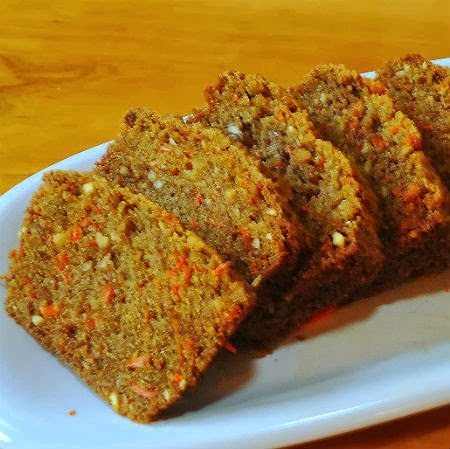 Carrots may sound like an odd ingredient, but try it! It’s more for texture than taste. Plus, the peaches will be the real stand out in this one! Make sure your peaches are ripe before starting though, because it will bring out a lot more of the sweetness that way! Preheat oven to 350. Bake pecans in a single layer in a shallow pan 8-10 minutes or until toasted, stirring halfway through. Cool 15 minutes. Stir together flour and next 6 ingredients in a large bowl; add peaches, next 4 ingredients, and toasted pecans, stirring just until dry ingredients are moistened. Spoon batter into a lightly greased 9×5 inch loaf pan. Bake for 1 hour and 10 minutes or until a long wooden pick inserted in center comes out clean. Cool in pan on a wire rack 5 minutes. Remove from pan to wire rack, and cool completely (about 1 hour).